Are polyols zero-carb? Not all of them are - some have digestible carbs. Low-carb and Keto diets are becoming popular. I keep seeing new product brands – low-carb cookies, Keto bars, sugar-free sweets – all sweetened with sugar substitutes like polyols or artificial sweeteners. It’s great to have so much choice. Unfortunately, not all these products are as good as they claim. Small companies – usually run by low-carb dieters and enthusiasts – tend to do a good job. They care about their clients and make products that are genuinely low-carb. But many businesses jump on the bandwagon just to make a quick buck. Either they don’t understand low-carb well enough – or they don’t care. Their products might carry “low-carb” or “sugar-free” labels – while containing sugar, in some form or another. There is one particular trick that I see very often – incorrect labelling of sugar polyols. Polyols are organic substances derived from real sugar. Our bodies cannot process them in full. Therefore, not all the carbs they contain are digestible. So far, so good. The biggest myth about polyols is that they are all zero-carb – not true! All polyols are partially non-digestible. But the digestible amount varies a great deal. It depends on the type of polyol – some are almost zero-carb, but some go as high as 60% carbs. 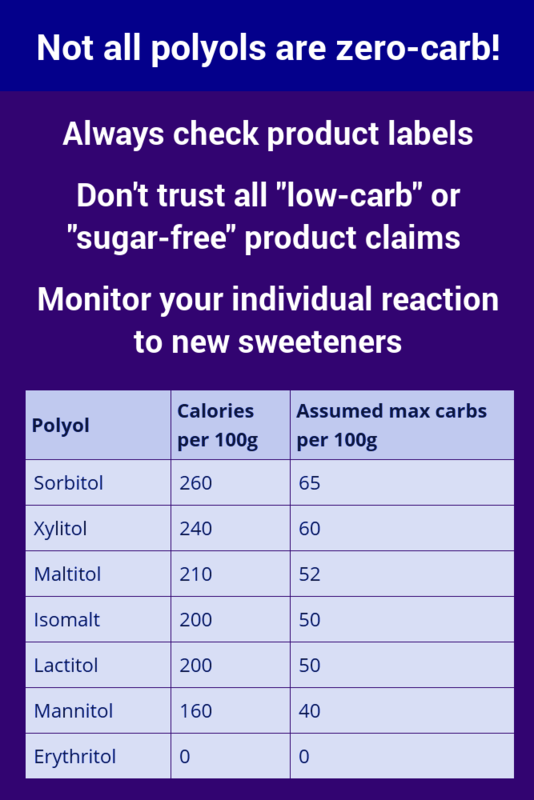 The dirty trick by dodgy low-carb merchants is to pretend all polyols are zero-carb. They subtract grams of polyols from total carbs and bingo! They can slap something like “3g net carbs” on their product – whereas in reality, the carb content is much higher. Low-carb is still a niche market. Regulators have not yet caught up with the specific needs of our community. There are strict and precise regulations for other types of nutritional information, like calories, fat, protein and total carbs. But there are no official regulations regarding the counting of “net carbs”. So unscrupulous merchants can get away with claiming whatever they want on flimsy pretexts. The best polyol – genuinely almost zero-carb (around 0.1% sugar) – is erythritol. Regulators in all countries allow labelling of erythritol as zero calories. This means that none of the carbs in erythritol are digestible. Erythritol mixed with Stevia extract is a popular sweetener formulation. It is granulated and is suitable for all uses – cooking, baking, adding to drinks, sprinkling on food. Popular brand names for erythritol/Stevia mix are Sukrin and Swerve. Erythritol is more expensive than other polyols. Sugar-free sweets and bars tend to use cheaper versions, like sorbitol or mannitol. The few low-carb brands I came across that use erythritol as sweetener are Chocoperfection and Quest. What about the other polyols? Except for erythritol, it’s quite hard to tell precisely how many carbs polyols contain. There are guidelines on carbohydrate absorption rates for polyols. But they do vary by individual – some people may absorb more than others. Then there is a question of their effect on blood glucose. Some of them do not raise blood glucose, despite a high absorption rate. There is also the issue of psychological reasons – some people release insulin in response to sweet taste alone. And there is some anecdotal evidence that sweeteners can increase cravings for real sugar. Overall, it’s a complicated issue. I couldn’t find any scientific studies on the effect of polyols on ketosis and low-carb progress. So how can we decide whether a polyol is safe? I suggest two criteria – calories, and your own personal experience. Note the difference in permitted calories between erythritol and other types. Polyols do not contain any other macronutrients except for carbohydrates. If there are calories, this means some of the carbs are getting digested. Your own individual reaction may vary. But you can use these values to get a rough idea of the potential carb content. We are all different. Individual reactions to polyols (and other types of sweeteners) are notoriously diverse. Some people have no issues with sweeteners whatsoever. They can have them regularly without any adverse effects on their diet progress. Many manage to stay in ketosis while having sweeteners. But some of us struggle. For some, even a small amount of sweeteners can interrupt ketosis and stall the weight loss. If you can, avoiding all sweeteners would be safer. But if you do still crave the sweet treats, then try them out and watch your reaction closely. As mentioned above, erythritol and erythritol/Stevia mixes are probably your best bet. (Safe non-polyol options are monk fruit extract and sucralose). If there is no effect on your ketosis, cravings or progress – then great! You can continue your weight loss while enjoying sugar-free treats every now and again. But if they do knock you off course, then it would be best to abstain. Please also note that if you are on a natural-only clean-eating plan, like Paleo or Zero-Carb (Carnivore) diets, then sweeteners won’t be suitable for you, regardless of their carb content. Polyols are closer to natural substances than artificial sweeteners, but they are still heavily processed and refined. 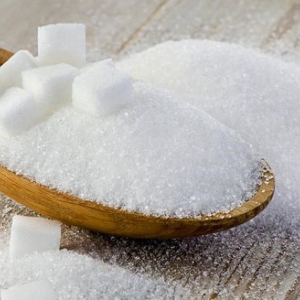 Do you have sweeteners regularly on your low-carb diet? How are they working out for you? Please share your experience in the comments. Hi Daniel, I find that it really depends on the brand. Truvia works for me – the taste is almost the same as sugar and no unpleasant aftertaste. Other popular brands of erythritol/Stevia are Swerve, Natvia, and Sukrin.